Salt River Pass is a low pass at the north end of Star Valley. It crosses from the Snake River (Pacific) drainage to the Bear River drainage. From there the water quickly descends into the Great Salt Lake and eventually evaporates. The entire road has a pretty good shoulder. The route does not involve a great amount of climbing, but a ride provides for plenty of time to wonder about its interesting historical role played by this crossing. From North. Leaving Afton the straight road climbs perceptibly, but no more than that. The first few miles are rumble stripped, but there is enough of a shoulder for a bicycle to the right of it. After passing through Smoot (elevation profile starts here) and its single General Country Store, the settlements of Star Valley thin out and the road enters a wide ravine. The road follows the bottom of the ravine with a few small curves. After such an eventless approach it comes as a surprise that there is actually a short fairly steep climb near the top, and that there is something like a pretty nice view in both directions. But I still think the Salt River Range looks more impressive from the west side of Star Valley, from towns like Fairview. The top has a sign and some informational tablets about the Lander Cutoff. From South. (also described upwards) From its junction with Wy89, US89 follows gently rising, sometimes winding Salt Creek through a maze of partially forested hills and sagebrush valley bottoms. There is an uninterrupted good shoulder. out and back ride: jct US89 - IGO road <> Salt River Pass <> north end of Afton: 55 miles with 2600ft of climbing in 4 hours (r2:10.9.15). The Fur Trade: In 1811 two separate expeditions headed for today's Washington coast in the hope of establishing a fur trade post for John Jacob Astor and his Pacific Fur Company. One was the ship Tonquin and the other was a 65 man overland packtrain. Members of the two parties met as planned in 1812, but neither had good news to report. Already the previous year the ship Tonquin had been seized by Indians, and subsequently blown up by four of its own crew members, while the Indians were still on board. The land based party of the expedition did not fare much better. It had followed a circuitous route over Powder River Pass, Union Pass and Teton Pass (plus smaller passes and divides). The route was of no use for making subsequent packtrains possible. All that was left by the unhappy expedition members was to return and tell Astor the bad news. Surprisingly in hindsight the overland return trip was the more important leg of the expedition. It also involved an entirely unplanned crossing of Salt River Pass. The return trip was led by Robert Stuart and from the beginning it was not entirely clear, that they would retrace their old route. On the Snake River Plain in today's Idaho they heard about a shorter route, "devoid of mountains" from Snake Indian guides. They didn't think much of it until they met three trappers still in the mountains from an Andrew Henry expedition: Hoback, Reznor and Robinson and a forth trapper Joseph Miller. After a difficult ramble through parts of Wyoming and Utah the previous summer the group of four had not found this route "devoid of mountains", but now thought they could do better with their newly won reconnaissance. Joseph Miller agreed to guide the Astorians through this new route. 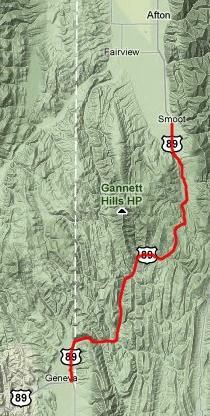 But the result was a yet another wild detour, comparable in length to Lewis and Clarke's detour over Lemhi Pass. First they followed the flat area south of the Snake River plain to where the Bear River flows north, near Dingle Utah. Here they figured they were south of the Teton Range, and they assumed that to the east - somewhere behind these lower hills - was a north flowing Green River. Crow Indians were following them, and consequently they entered the maze of hills that makes up the Sublette Range, Salt River Range, Gannett Hills and others. In the process they turned back up north and crossed Salt River Pass, arriving in today's Star Valley. Still looking for a north flowing Bear River behind mountains, they crossed Sheep Pass. Descending from this high trail in the Salt River Range they arrived at the next river. Was it flowing north ? Well no, it wasn't. It was Greys River leading them back to the Snake near today's Palisades Reservoir. There the Crow Indians finally caught up with them and attacked them. From here on he Astorians further return would converge with their original path west, but only for a while - onwards to Pierre's Hole, and east wards over Teton Pass. Heading south along the Green River Range they stumbled upon a pass, which was so flat that it really was "devoid of mountains" as the Snake Indians had promised. The very designation "pass" really makes no sense at all, unless you see it in the context of this search for a way to bypass mountains. This would turn out to be the real significance of Astor's Columbia expedition, the discovery of South Pass, and nobody at the time had any inkling that it had manifest destiny written all over it. Lander Cutoff: Several informational signs along the pass road pertain to the Lander Cutoff. This route skirts the lower eastern approach without going near the top of Salt River Pass. The Lander Cutoff was a route north of the Oregon Trail, that became practical after the California Gold Rush. Miners were now heading not only for California, but also Oregon and Washington. Also, conflicts with Mormons on the Oregon trail after the Mormon War of 1857-1858 made a route to the north of mormon Utah attractive.